I found your information on the disaster very interesting. My father came from Creswell and got out of the mine a year before the disaster or maybe I wouldn't be here. His brother in law, my uncle was killed. I never knew him because it was the year I was born - Arnold Robinson. I would like to put a link to your site on mine. Do you have any objections? Your site is very good. Well done! Living in Sneyd Green, my 13 yr old daughter and I were out walking through the grave yard with our dogs, when we saw a grave stone telling of the "Sneyd Green Disaster". We went home and were interested as to what this was. Having typed in the details in the search engine on the internet we came across you web site. There was the information we were after. I tried mailing a long time ago but I don't think it made it through your spam traps. I'm trying again, this time from work mail which may have more luck. Simply to say thank you for creating, updating and maintaining the web site which I found fascinating. As you can see from my name I have a particular interest in the contents as the Eric Scattergood mentioned on the site is my uncle, his younger brother Keith is my father making the William Scattergood featured my Grandfather. Hi there, I sit here in Queensland Australia where it is warm and sunny but your web page takes me back to the place of my birth. It is so pleasing to see that miners and their families are remembered. I was born at Watnall Pit in 1927. We moved into Watnall and I remember well the 'paddy' as their train was called and thackened miners as they made their way home. Thank you for your page, I shall visit it more often. I'm doing the Gresford Disaster Ballad at school and we have to write a newspaper review about it. Just found your site whilst researching some information on the Manvers Main complex in South Yorkshire. I’m looking for some old pictures of Manvers Main and have found some on your website. I wondered if it would be possible for me to reproduce these photographs for my employer’s intranet site? The reason I would like to use them, is that I work at The Pension Service based in Dearne Valley, in a building built on the site of the old colliery! We are developing our intranet site and would like to include a section on the history of the area. The picture would be used to show what Manvers used to look like, compared to today’s modern business unit in which we work. I also intend to provide some background information about the mining industry. In fact my husband, who used to work at Wath Main Colliery, says our office is built very near to Manvers Number 1 shaft where the men used to descend and ascend into and from the pit! 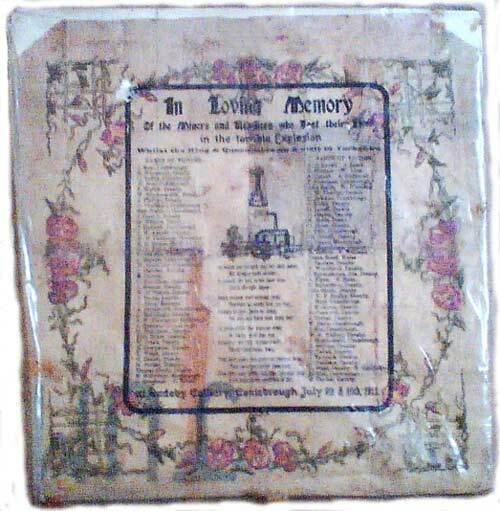 My name is Darren whilst clearing out a garage recently as part of my job I came across an item regarding the Cadeby Colliery disaster, which I thought may be of interest to you. In loving memory of the miners and the rescuers who lost their lives in this terrible explosion whilst the king and queen were on a visit to yorkshire. It then lists names of the poor souls who lost their lives in this tragic disaster. There is also a poem in the centre and a picture of the colliery. I have attached a photo although not very clear with this e-mail. Thankyou for taking the time to look at this item and look forward to hearing from you.